But there were still times when I could not help myself and had to capture some photos to fill my creative soul. Most of my photos were taken underwater on this trip, with my wife, daughter and I using a combination of a Canon underwater point-and-shoot camera and a GoPro Hero 4. But on our first full day on the island, I took the Canon 5D Mark IV (with the Canon 100-400mm lens) down to the water and took photos and video of this Green sea turtle making his way back into the ocean. You can see the video of this and more at the end of this blog. But as I mentioned, most of my photos were taken underwater when we were swimming with the turtles. And there were a lot of turtles to be seen, as we were staying in a condo that was 100 feet from shores of turtle cove. I preferred to photograph the sea turtles when they were close to the surface, for two reasons. First and foremost, the light is better near the surface which yielded better images, and secondly, I liked the reflection of the turtles on the surface of the water. Sometimes when the turtles would dive down, I would take a deep breath and follow them down to get shots of them nearer the ocean floor. While swimming, I saw these rays of sunlight coming from the water's surface and loved how it framed the two turtles. Oh wait - before I go on I need to tell all of you about the editing process for these photos. This is the original photo of what you just saw above. When you take photos or video underwater, the cameras have a hard time determining the proper color levels. You will need to edit those photos to bring back the contrast and color. Each of the underwater photos that you see in this blog have been retouched in Adobe Photoshop CC. I adjusted the white balance, contrast, shadows and highlights to make the images appear closer to what I saw when snorkeling. What a huge difference, huh? I had fun following the turtles as they swam from one location to another. Like photographing any subject, I enjoyed the challenge of capturing photos of the turtles from different angles. For this shot, I was floating in place and saw this turtle swimming right towards me. The turtles come up for air periodically, so it is not hard to get photos like this of them by the surface. It took a couple of tries, but I managed to get this photo half above water and half underwater, which gives you a perfect example of how the turtles come up to breath. 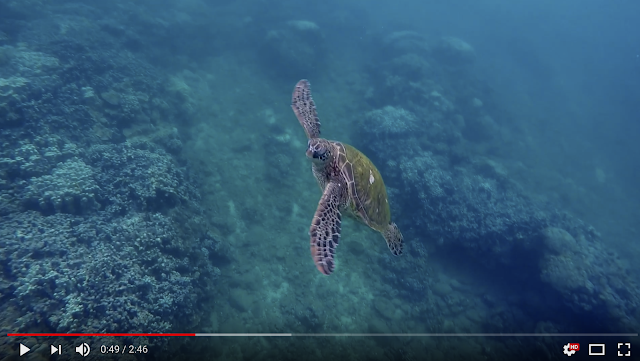 This shot is a little different, because the turtle was swimming in shallow water, with both the ocean's bottom and the water's surface in the same image. After they would come up for air, they would swim down deep and park themselves under the rocks and coral. My wife and daughter was hanging around this turtle and watching it intensely. I was so busy trying to get steady video with the camera, that I did not notice what intrigued them. This turtle was missing it's front right flipper, but still managed to swim around as well as any of the others. We nicknamed this one "Nubby". We looked for this turtle a couple of days later, but could not find him again. At the beginning of this blog, I mentioned that I took video footage both above the water and below. You can click on the image below to watch my short 2 1/2 minute video compilation. I hope you like it! Now the relaxation is over and I am back to the real world. During these three weeks I will be capturing 3 Bar Mitzvahs, 2 NHL games, one vow renewal, one adoption ceremony, and preparing camera gear and clothing for the Winter Olympics. From this point on, it is full speed ahead (which I know how to handle better than the slow island pace anyways). These are wonderful photos! Wish I could learn to do that!